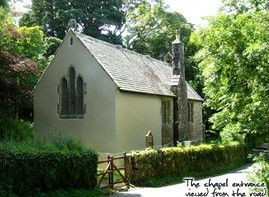 St. Raphael's Chapel situated in the beautiful hamlet of Huccaby on Dartmoor, is a place of peace and tranquillity. Built in 1868 as a combined chapel and schoolroom, it has the distinction of being the only Anglican chapel in the country to be dedicated to the Archangel St. Raphael. His name means 'God's Healing' or 'God has healed' and he was one of the archangels who stood before the throne. He is also known as the patron saint of travellers.